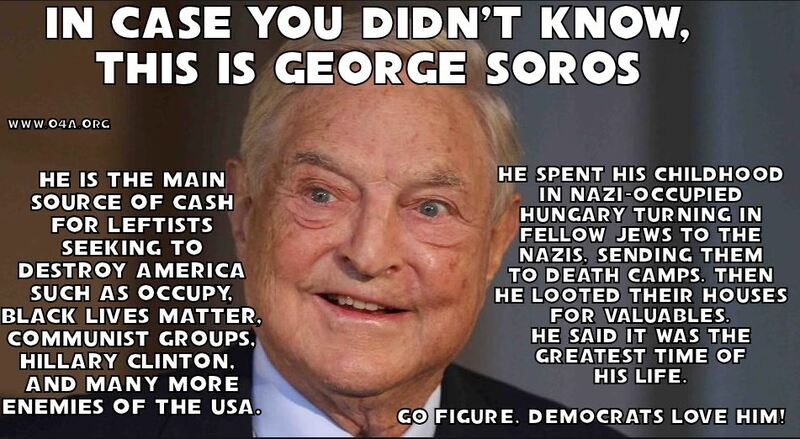 THE BIG MONEY IN THIS COUNTRY BEHIND ALL THE VIOLENCE, STAGED PROJECTS AND ANY AND ALL ANTI-AMERICAN ACTS ARE BEING PAID FOR BY GEORGE SOROS, ONE OF THE MOST VILE, EVIL MEN (Nazi collaborator) ON THE FACE OF THIS EARTH THROUGH HIS MULTIPLE (listed below) FOUNDATIONS AND ORGANIZATIONS. HE HAS BEEN USING HIS BILLIONS OF $$ TO DESTROY COUNTRIES FOR YEARS DESTROYING PEOPLES LIVES AND HE IS MOST CERTAINLY ON THE MOVE TO DESTROY AMERICA. Self-professed Nazi war criminal George Soros continues to go free while radicalizing American politics and society, but not for long…The strategy to take him down is by first openly identifying the organizations he owns and funds. And here they are, finally, out in the open, more than 200 of them he created to sabotage the United States. American Civil Liberties Union: This group opposes virtually all post-9/11 national security measures enacted by the U.S. government. It supports open borders, has rushed to the defense of suspected terrorists and their abettors, and appointed former New Left terrorist Bernardine Dohrnto its Advisory Board. Arab American InstituteFoundation: The Arab American Institute denounces the purportedly widespread civil liberties violations directed against Arab Americans in the post-9/11 period, and characterizes Israel as a brutal oppressor of the Palestinian people. Brookings Institution: This organization has been involved with a variety of internationalist and state-sponsored programs, including one that aspires to facilitate the establishment of a U.N.-dominated world government. Brookings Fellows have also called for additional global collaboration on trade and banking; the expansion of the Kyoto Protocol; and nationalized health insurance for children. Nine Brookings economists signed a petitionopposing President Bush’s tax cutsin 2003. Center for Constitutional Rights: This pro-Castroorganization is a core member of the open borders lobby, has opposed virtually all post-9/11 anti-terrorism measures by the U.S. government, and alleges that American injustice provokes acts of international terrorism. Defenders of WildlifeAction Fund: Defenders of Wildlife opposes oil exploration in Alaska’s Arctic National Wildlife Refuge. It condemns logging, ranching, mining, and even the use of recreational motorized vehicles as activities that are destructive to the environment. National Women’s Law Center: This group supports taxpayer-funded abortion-on-demand; lobbies against conservative judicial appointees; advocates increased welfare spending to help low-income mothers; and favors higher taxes for the purpose of generating more funds for such government programsas Medicaid, food stamps, welfare, foster care, health care, child-support enforcement, and student loans. Public CitizenFoundation: Public Citizen seeks increased government intervention and litigation against corporations — a practice founded on the notion that American corporations, like the capitalist system of which they are a part, are inherently inclined toward corruption. Sojourners: This evangelical Christian ministry preaches radical leftwing politics. During the 1980s it championed Communist revolution in Central America andchastisedS. policy-makers for their tendency “to assume the very worst about their Soviet counterparts.” More recently, Sojourners has taken up the cause of environmental activism, opposed welfare reform as a “mean-spirited Republican agenda,” and mounted a defense of affirmative action.